THE SHOWBIZ LION: SLOW DANCE OR NETFLIX AND CHILL? A Scots nightclub is bringing back the slow dance in a bid to return romance to the clubbing scene. 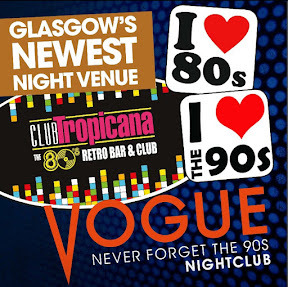 Club Tropicana And Vogue which opens in Glasgow this Saturday promises punters the ultimate night of nostalgia in it's two separate 80's and 90's music rooms - and it's owner is keen to combat Tinder and Grindr and encourage people to socialise properly. The venue in the city's Renfield Street joins others in the company in Aberdeen, Dundee and Edinburgh and owner Tony Cochrane reckons its the perfect antidote to life online and 'Netflix and Chill'. He said: "We're bringing back the slow dance at the end of the night so people can get up close with one another. With the advent of online dating and apps like Tinder and Grindr so many people meet their partners online now that they've forgotten what its like to smooch." As well as the slow dance which used to be known in certain circles as 'the erection section', Tony plans to attract a younger crowd who appreciate all things 90s like Trainspotting and Raves which used to pop up all over the country. Tony said: "The music was awesome too with Girl Power for the Spice Girls, Brit pop with the Oasis vs Blur battles, dance tunes from TTF, Robin S and Faithless." He's also hoping to get a visit from some of the original 80s kids who will appreciate Club Tropicana and the decade of excess. Tony said: "Can you remember who shot JR, or getting busy with the fizzy Soda Stream?The music was amazing with everything from ABC to ZZ Top. Re live the good old days with the tunes you can dance to as well as sing a long too. If you cant sing it we don’t play it. Its about the best fun you can have with your clothes on!"